The versatile, reliable Epson Perfection 1200U desktop scanner nearly lives up to its name. At the lower end of Epson America Inc.'s Perfection series, the 1200U boasts full plug-and-play and Universal Serial Bus connectivity. All Perfection scanners incorporate three new scanning technologies: Micro Step Drive, text enhancement and auto area segmentation. The 9.9-pound Epson 1200U comes close to perfection for a $249 desktop scanner. The Micro Step Drive uses extra memory inside the scanner plus a stepper motor to retrace or half-step a scanned image, enhancing resolution up to 9,600 dots per inch. It makes a real difference in speed and quality. The machine took only 65 seconds to scan a detailed photo at 400 dpi in the Epson Stylus Printer fine mode. Up to a magnification of 600 percent in Adobe PhotoDeluxe, a minimal number of visible pixels gave a clear view of objects in both the foreground and the background. On other scanners, a photo that looked equally clear at the same magnification took me two or three minutes to scan at a higher setting than 400 dpi. When I switched modes to Epson Stylus Printer photo resolution, the scanning time went up by a minute, but the clarity went up, too. I could even see my fingerprints on the photo image. At the highest resolution, 9,600 dpi, scan time jumped to three or four minutes, which is still fast, and in Adobe PhotoDeluxe I could identify the foreground objects at up to 1,000 percent magnification. In scanning text, however, the Epson Perfection 1200U's new technologies performed less impressively. Text enhancement and auto area segmentation supposedly improve optical character recognition. Text enhancement is intended to make text scan better from colored backgrounds, and auto area segmentation lets the unit automatically detect graphics and pictures embedded in a text page. But when I set the image type and destination as OCR in the scanner window, the text was not recognized well enough to transfer into Microsoft Word 97. Without OCR mode selected, however, the OCR application picked up text in different-colored backgrounds very well. Images embedded in text documents came in well, too. Installing the scanner was not as easy as I expected given its USB interface. At first my test computer could not locate the device drivers on the software CD-ROM. I canceled the device detection wizard and started over. This time, the computer could not detect a new device connection through the USB port, so I had to select Add New Hardware in Microsoft Windows 98's Control Panel and go hunting manually for the device drivers. After finishing in 20 minutes what should have been a 10-minute process, I loaded the software and found an amazing array of programs: Adobe PhotoDeluxe; PhotoPrinter from ArcSoft Inc. of Fremont, Calif.; PrintShop PressWriter from Broderbund Software Inc. of Novato, Calif.; and Presto PageManager from NewSoft Inc., also of Fremont. 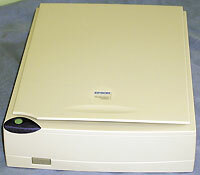 An additional CD had a program called Epson Instant Photo Print. My question was, 'Which program should I use to activate the scanner?' It turned out to be Presto PageManager, which is not a very helpful title. It would be better to call it Epson TWAIN 4, which is what shows up when you launch Presto PageManager. Presto PageManager itself is well designed and looks like Web e-mail. It has a hyperlink on the left side to an inbox and folders. At the bottom of the page you can place applications such as Adobe Photoshop, Microsoft Word or your printer icon. The software and the high-quality scanned images make this 11.3- by 16.8- by 3.5-inch business scanner well worth its $249 price.